There are not a lot of downsides that come with RV living, but one of them is that you have to empty your black tank so let’s find the best RV sewer hoses to avoid leaks available on the market today. Of course, all of them are designed not to leak, but from my own experience, it doesn’t always matter what the company says. What matters is how the product performs in real-world use. Not only can they have leak issues, but also durability issues. I have had kids run over my sewer hose which has resulted in a broken one. So I have learned my lesson that it’s worth it to spend more for a higher quality one that is durable. 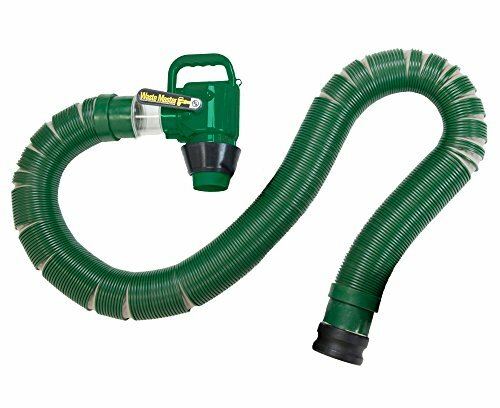 There are a lot of things to consider when purchasing a sewer hose, and there are also a lot of accessories. I will answer the most frequent questions and share my recommendations for accessories at the bottom in the FAQ. For now, let’s take a look at the best RV sewer hoses I have chosen that I believe will make the whole dumping process more bearable. What is a camping accessory comparison without a Camco product? We’ll be taking a look at two sewer hoses from Camco today, and the RhinoFLEX is the first one. When you buy the RhinoFLEX kit, you get two 10 feet hoses that connect to each other with pre-attached bayonet and lug fittings, and a white elbow with a 4-in-1 adapter for the sewer in the ground. It also comes with storage caps for when not in use. The fittings on this hose swivel. The hose is made out of polyolefin and reinforced with steel wire. Does that mean that it’s safe to run over with a car? No, try to avoid that. The reason there is a 4-in-1 adapter included is that sometimes you get to a dump station with pipes that don’t fit your standard sewer hose. The adapter isn’t something you have to change out, it’s more like steps on the end of the adapter that lets it go more or less deep depending on the pipe. Another great thing with the included adapter is that it’s an elbow so your pipe won’t be sticking straight up out of the ground. By having a 90-degree angle you can put your sewer hose straight on the ground next to it. As soon as you use one you will realize how great they are. The four storage caps are supposed to be put onto the end of the hoses when not in use to keep animals out and odors in. The storage caps can be put on after taking off the elbow adapter, taking off the elbow adapter will also let you store the hose in the square bumper on your RV. The RhinoFLEX comes in 15-feet and 20-feet options, but there are also extension kits available. What I am missing from this kit is two clear fittings. What I mean by clear is that they’re see-through. The included fitting is translucent but not completely clear. Having clear fittings might not sound like something you would want, but it’s a great way to see if the tank is empty and how clear the water is after using a black-tank flush. Translucent is better than nothing but I still prefer clear ones. If you do purchase this kit, there are ways to put clear fittings on it which I will go through in the FAQ at the bottom of this post. The RhinoFLEX used to have a clear fitting included, but it’s now translucent for some reason. The second product from Camco in today’s comparison is the Super Kit model number 39659. It also comes with a 4-in-1 sewer connection adapter and two 10 feet hoses you can connect. What makes it different from the RhinoFLEX is that made with more durable HTS vinyl. It also comes with clear fittings on both sides. Both the elbow adapter and the fitting for the RV side. The fittings swivel to make it easy for you to connect and disconnect. I like this one due to the durability and the clear fittings included. It only comes in 20 feet but since it’s two 10 feet hoses that you can connect I think it will be good for most people. The reason it comes like that is just like with water hoses, sometimes you need more, and sometimes you need less. This model also easily stores in the square bumper when compressed thanks to the fittings being detachable. Two bayonet and two lug end caps are included for when not in use. The Camco RhinoFLEX has a slightly more ergonomic fitting due to plastic tabs that help increase the grip when connecting the hose to the RV or the sewer connection. But what you miss out on with the RhinoFLEX is the clear fitting design, again this is something that a purchase of a clear fitting can fix. 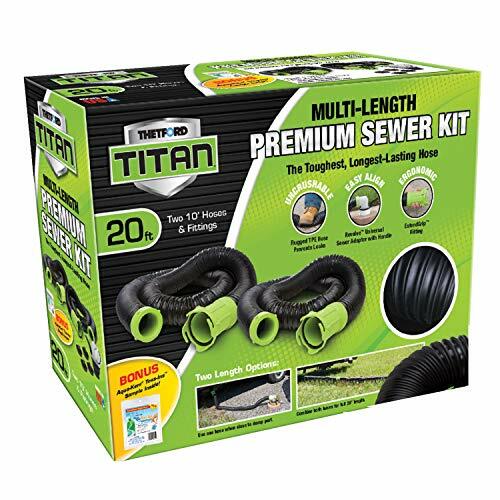 The Titan from Thetford is a durable heavy duty sewer hose that can take a beating. Made out of TPE, it can easily be run over by a car without cracking. It’s also great in extreme temperatures. The included adapter has one more step compared to the Camco models, so it’s a 5-in-1 adapter. The elbow adapter is not transparent but it’s more clear than the included fittings. There is a handle on the adapter to make it easy to use and help keep your hands away from the sewer connection while attaching. Just like most other models in today’s comparison, the Thetford Titan comes with two 10 feet hoses that can be connected to create a longer hose. What’s great about the fittings on this model is that they’re longer, so you have more to hold on to. It also has better grip than Camco’s clear fitting, although not as good as their non-clear fitting. The kit comes with four end caps for when the hose is not in use. So what are the downsides with TPE? The hose won’t retract and compress as well as the other hoses. It is heavy duty and can take a beating, but it’s not as easy to store compared to other vinyl or polyolefin models in my experience. You will have to retract it yourself before putting it away which quickly can become an extra step that can feel like a burden. So if you’re planning on storing your hose in the square bumper, I would go with a different model, but if you put your hose in a box and throw it in the back of your truck or into the storage compartment when done, it’s a great product. It is missing the transparent fittings that I love, but the fact that the fittings are easy to handle due to their length is a pro. The Lippert Waste Master is what I recommend for full-timers. The hose is UV-protected and goes from 5’6” feet compressed to about 18 feet extended. It’s not split up in two but still easy to use thanks to its material that stays as extended as you want during use. The outside of the hose is designed with helical coil while being smoother on the inside to prevent waste from getting stuck. Where this sewer hose shines is on the part that you connect to the sewer connection. It has a permanently installed nozzle with a handle that also has a shut-off valve and a transparent pipe. So what would you use the valve for? Well, it’s nice to be able to fill the hose with clean water and then empty it so you can wash it. It’s also good for storage, instead of using end caps you can just shut the valve. What makes the Lippert Waste Master stick out when compared to the other models is the way you connect it to the RV. To use correctly, you will have to install the so-called Cam Lock on your black/grey water pipe, which is to ensure a leak-proof connection with the hose. The important parts of the Cam Lock are the clamps that you will use to lock the hose in with. When installed you will put the hose in it and clamp it in, and it will be ready for use. A more industrial solution usually used when transporting liquids. What’s great about it is that it doesn’t take any longer than screwing on a regular fitting and it’s more leak-proof. Like I mentioned earlier, right before the shut-off valve there is a clear pipe where you can see how clean the water is that’s coming out of your tanks. And instead of having a 4 or 5-in-1 adapter, on the end is instead a rubber doughnut to take care of the differently sized sewer connections. So it doesn’t have an adapter, but a different solution that is even better than an adapter. The rubber will hold on to the pipe better than the plastic adapters. Note that this sewer hose is slightly heavier than the other hoses in today’s comparison, and the permanently installed nozzle will stop it from fitting in the square bumper. I recommend buying a box to put this in for storage. If the length is not long enough, there is an extension kit for this product that you can find here! Four sewer hoses later I hope I have made it more apparent how they differ from each other and the features they have. Just like when I wrote about water hoses, the best product for you depends on what kind of camping you do. If you only camp once a year, you shouldn’t spend a lot. If boondocking is your thing and you only empty your tanks at waste stations, how durable your sewer hose is matters less. But if you stay at campgrounds and have people and cars around your hose, durability becomes one of the most critical aspects. That said, something you might have noticed that I keep coming back to is the clear fitting. The clear fitting that lets you see how dirty the water is coming out of your tanks. Not for fun, but so you know when it’s clean enough to disconnect and put away. I recommend reading about each product in the spotlight above and decide what you need, but here are my recommendations based on what kind of camper you might be. Good: Camco Super Kit 39659 – This Camco model has clear fittings, two hoses, a 4-in-1 sewer connection adapter, fits in the square bumper, and made with HTS vinyl. A great product for people just starting with the RV camping and wants the best features for a reasonable price. Also Good: Thetford Titan 17902 – It might be missing a transparent fitting and be more tricky to put away. But this durable sewer hose will be great at the campground where you have to deal with other people and vehicles. Use just one or both the 10-feet hoses and connect it to your RV with the grip-friendly fittings. Better: Camco RhinoFLEX – The RhinoFLEX is popular, and for good reason. It’s durable, easy to use with good grip, and exactly what most campers are looking for. A versatile sewer hose that doesn’t leak, from a reputable company. Best: Lippert Waste Master 359724 – For the serious camper that is either fulltime or wants a heavy duty leak-free industrial designed hose, the Waste Master is hard to beat. Although you have to install the Cam Lock on your RV before first use, dumping your tanks after that will be a much more pleasant and leaf-proof experience. Built-in shut-off valve with a big handle will help you stay away from getting too close to the sewer. It extends from 5’6” feet compressed to 18 feet. All you have to solve is how you’re going to store it while not in use. What should I consider before buying a sewer hose? Durability – How often and where do you camp? Campgrounds? Boondocking? Like I mentioned in the conclusion above, if you’re at campgrounds around people and vehicles, durability becomes more critical. If you camp in all kinds of weather, durability, and strong material is essential. If you mostly boondock and empty your tanks at a waste station, durability will matter less, and other features become more important. Because then you will only pack it out and in and be done with it. Some people do it this way at campgrounds, so how important durability is depends on the way you use it. Storage – Do you want to be able to store it in the bumper on your RV that usually measures 4×4 inches? Then you will have to go for a smaller model without any fancy nozzles that will make that impossible. If you buy a bigger one with fittings on it, can you detach them while not in use? Cost – This relates to the durability question. How often do you need a sewer hose? Once a year or once a week? It’s not necessary to spend a lot of money on a hose you use once a year. If you’re a full-timer, I recommend getting a good one like the Waste Master that once set up is easy to use, leak-proof, and reliable. A more expensive hose isn’t the best hose for everybody. Length – As we saw in today’s comparison, some models come with two hoses and some in just one long one. If you only empty at waste stations after boondocking and can get close to the sewer connection, a short one will do. Campgrounds, on the other hand, can be hard to work with and sometimes you end up with your sewer hookups being 20-30 feet from the sewer connection in the ground. Why do you care so much about a transparent fitting? They are fantastic when dumping. A transparent fitting will let you know how clean the water is coming out of your tanks, otherwise you will be guessing. If you don’t have a clear fitting to see this, you not only don’t know if there is still some water coming out, and you have no idea how clean the black tank flush has made your tank. If you buy a sewer hose that happens not to have a clear fitting you can buy one. Like this one from Camco that is a 45-degree fitting . Or if you want an elbow for the sewer connection, Camco has a clear model for that too. What other accessories are there related to black/grey tanks in the RV? Diamond Gloves – First things first, let’s be sanitary. Put on some gloves before starting the process to let our hands stay as clean as possible. A 100-pack doesn’t cost much and will last you for a long time. 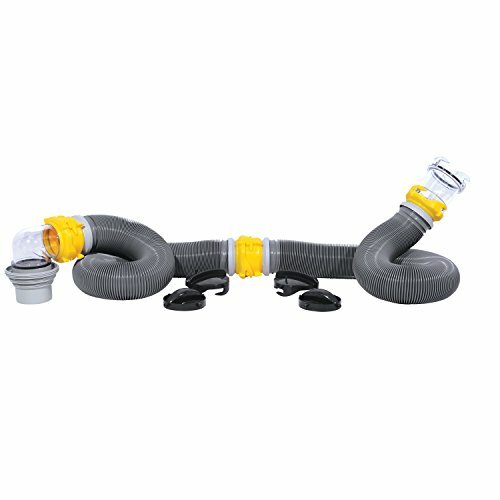 Camco Sewer Hose Support – Put this between your RV sewage hookup and the sewage connection on the ground and then put your hose on top of it. This lightweight plastic support will protect your hose from the ground and make it last longer. It will also help when emptying your tanks by creating a better angle for your hose to let the liquids run through easier as it creates a downhill. Valterra T58 Twist-On Waste Valve – If your standard valves are leaking and you want to shut them off entirely this will be a solution to that. If you’re the kind of person that doesn’t use your toilet in the RV and would like to use your black tank as a second grey tank, this can also assist you with that. What you then do is connect this, shut the valve, open the gray tank and the black tank at the same time, and let the water get split between the black and the grey tank. Make sure that your black tank isn’t full of anything to avoid water coming up your toilet. Valterra Hose Carrier – This hose carrier from Valterra will give you a place to put your hose when not in use if you don’t want to use the bumper on the RV or if it doesn’t fit there. It’s not much larger at 4 ⅜ inches compared to the standard 4×4″ bumper, but it might be enough depending on your hose. Then you could screw this down inside your storage compartment to secure it during travel. Camco Tank Rinser – If you don’t have a black tank flush and don’t want to stick a hose down your toilet, you can use a tank rinser like this one from Camco. The way it works is that you connect it to the tank connection on your RV and then you connect a water hose. When you turn it on it will rinse and flush your tanks that are open and then the dirty water will flow through if the valve is open and empty the tank. Camco Swivel Stik – If you want to make sure your black tank gets clean and you don’t have a black tank flush, you can put this down your toilet, and when connected to a hose it will spray the inside of your toilet. Just make sure to be aware of how much you have filled up the black tank not to have sewage water flying up at you. It’s a good idea to leave the black tank open and connected to a sewer in the ground outside during use. Camco Toilet Treatment – Keeping your black tank as clean as possible can be done with toilet treatment. There are liquids you can pour down the toilet, and then there are drop-ins like this product from Camco. Drop one in when your tank is empty, fill the tank with some water so it can do its job, and you will have a less smelly tank so you can stay out camping for longer. I use treatment in my RV toilet to be able to stay out camping for two weeks without a lot of nasty smell coming up from the wastewater tank. Camco Clean Out Hose – The last thing I will recommend today is a hose that you only use for cleaning your sewer hose and accessories to it. Use this kind of hose from Camco to rinse and wash your sewer hose after each time you have dumped your tanks. The Camco Clean Out Hose is also a great hose to use with some of the products above that require a water hose to be attached to it. Having this hose stored away from your fresh water hose is a must. How do I connect my sewer hose to the RV? The most standard connection on a sewer hose and the wastewater connection on your RV is called a bayonet fitting. It’s a fastening mechanism that locks in by a twisting motion. A bayonet fitting can take some strength to secure and may not be suitable for all users. What I prefer is the Cam Lock fitting found on the Lippert Waste Master that we looked at in the comparison today. Not only is it easier to put on with just a clamp on each side, but it’s more leak-proof than the bayonet fittings. So why isn’t the Cam Lock solution standard today? Well, it’s more costly because it uses rubber on both sides of the connection instead of plastic with an o-ring to prevent leaks. What alternatives do I have if I don’t want to deal with a black tank? A product that I have seen is getting more and more popular if you don’t want to deal with sewage the same way you have to when you empty a black tank, is Nature’s Head Self Contained Composting Toilet. The way it works is that you fill it with soil where your solids will go, and a container separate for liquids. Gone with the Wynns have made several videos about this product on their YouTube-channel that will tell you more about how it works and how good it is. Let me know if you have any questions and I will try to help you!